Extensive settlement began in the Valley, primarily by Hispanic farmers and ranchers from New Mexico, in the 1850s after the construction of Fort Massachusetts by the U.S. Army for protection against the Utes, who previously barred settlers. Settlers built a church in the village that is now called San Luis and dedicated it on the Feast of Saint Louis, June 21, 1851. The history of the post-war U.S. military presence in the Valley is preserved at Fort Garland and other sites in the Valley, which became part of the Territory of Colorado in 1861. The lands in the valley were surveyed by the United States using the New Mexico Meridian and Baseline, unlike the rest of Colorado. The valley was one of eight candidate sites to detonate the first atomic bomb when White Sands Proving Ground was selected for the Trinity (nuclear test). Today, the Valley has the largest native Hispanic population in Colorado; many families are directly descended from the original New Mexican settlers. The original Ute population was confined to the Southern Ute and Ute Mountain Indian reservations in the late 19th century. The San Luis Valley is the broad, generally flat, valley at the headwaters of the Rio Grande in south central Colorado and far north central New Mexico. The northern portion of the San Luis Valley is an endorheic basin; surface water does not exit this area. 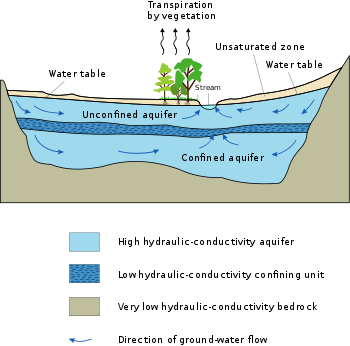 Irrigated agriculture is possible in the area due to groundwater and streams fed by the average 100 inches of snow the surrounding mountain ranges receive. The southern portion is drained by the Rio Grande. Much of the land in the San Luis Valley is used for grazing. Farming is generally concentrated in Conejos County and around the towns of Alamosa, Monte Vista and Center. Principal crops include potatoes, head lettuce, wheat, and barley. The barley grown here is the main supplier for Coors beer company. In 1982, quinoa was successfully grown for the first time outside of South America in the San Luis Valley of Colorado,  and commercial growth has occurred since 1987. Less favored areas with a shorter growing season and less access to water rights tend to be devoted to alfalfa and grazing. Broad areas, especially in Saguache County, Colorado have a high water table or are even flooded part of the year. Uncultivated land is often covered with "chico", low brush such as rabbitbrush, greasewood and other woody species. Cropland is typically irrigated with large (1/4-mile radius) center-pivot irrigation systems, and a common feature of the Rio Grande Delta area where the Rio Grande enters the valley are large piles of potato-sized rocks screened from the soil. There are over 500 known artists living in the San Luis Valley as evidenced by an ongoing directory maintained by Monte Vista artists' group, The Art Thing,  The Art Thing's membership boasts several nationally recognized artists working in various media. Monte Vista is also home to the  Monte Arts Council as well as several festivals and an art tour that attracts artists from as far away as California and North Carolina. Predominantly agricultural in nature, the area is also one of the poorest rural areas of Colorado. Tourism has become a more important part of the economy in recent years, coupled with attempts to establish the area as a retirement community. Adams State University, a four-year state college at Alamosa, with approximately 2,500 resident students, is the major educational institution in the Valley. It is supplemented by a campus of Trinidad State Junior College in Alamosa. San Luis Valley Regional Medical Center, a full service Acute-Care hospital and specialty physician clinic is the largest employer in the Valley with over 600 employees. The arts are becoming an increasing force in developing the economy of the San Luis Valley. There are also a number of utility-scale photovoltaic power stations in the valley, and an active market in selling or leasing land to be used for solar facilities. In 2007, SunEdison constructed the 7.7 megawatt Alamosa Photovoltaic Power Plant on about 80 acres near the town of Mosca, Colorado. It was the largest grid-connected solar electric facility in the United States at that time. It was followed in 2010 by the 19 megawatt Greater Sandhill Solar Plant, in 2011 by the 30 megawatt San Luis Valley Solar Ranch, in 2012 by the 30 megawatt Alamosa Solar Generating Project, and in 2015 by the 50 megawatt Hooper Solar PV Power Plant. All are located on previously developed agricultural lands near Mosca. ^ J. E. Upson (October–November 1939). "Physiographic Subdivisions of the San Luis Valley, Southern Colorado". The Journal of Geology. The University of Chicago Press. 47 (7): 721–736. doi: 10.1086/624829. JSTOR 30056469. ^ Siebenthal, C.E. (May 13, 1910). 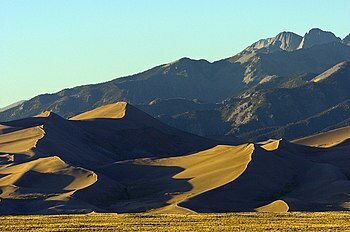 "The San Luis Valley, Colorado". Science. New Series. American Association for the Advancement of Science. 31 (802): 744–746. doi: 10.1126/science.31.802.744-b. ISSN 0036-8075. JSTOR 1634777.